The wait is over! 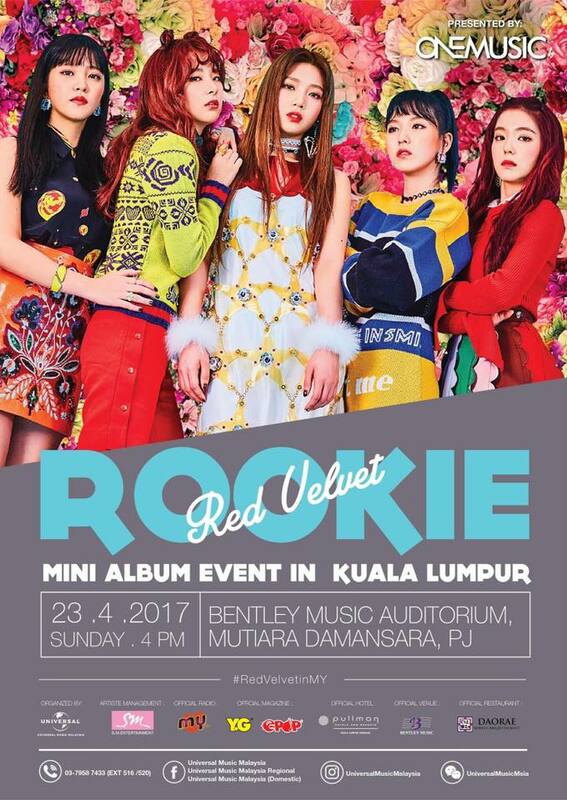 Red Velvet, a Korean girl group of SM Entertainment, will be coming to Malaysia for the very first time on 23rd April 2017 to promote their 4th mini album, titled [ROOKIE]. Coming from the same company as the well-known K-Pop artists such as TVXQ!, SUPER JUNIOR, GIRLS’ GENERATION, SHINee, f(x), EXO, and the newly debuted NCT, Red Velvet is a group with five members – IRENE (the group leader), SEULGI, WENDY, JOY, and YERI. The group debuted with four members on 1st August 2014 with their digital single 'HAPPINESS' and the youngest member YERI joined the group in March of the following year with the release of their first mini album [ICE CREAMCAKE]. On February 2017, Red Velvet released their 4th mini album [ROOKIE]. The music video of the title track 'ROOKIE', the same name as the album, reached two millions views within 12 hours after release. On the first day of the album release, it charted at No. 1 on iTunes in several countries. Red Velvet has released a total of two digital singles, four mini albums and one full album to date. For the very first time, Red Velvet will be coming to Malaysia for the ‘Red Velvet [ROOKIE] Mini Album Event in Kuala Lumpur’ presented by ONEMUSIC on 23rd April 2017 (Sunday) at 4.00pm in Bentley Music Auditorium, Mutiara Damansara. The group will not only be performing their hit singles at the event, they will also be signing autographs and interacting with fans in Malaysia. From 31st March 2017 onwards, fans who purchase Red Velvet’s latest mini album, [ROOKIE], from CD Rama will get one pass to attend the ‘Red Velvet [ROOKIE] Mini Album Event in Kuala Lumpur’ presented by ONEMUSIC (while stock lasts). There will also be an early bird promotion where fans can purchase the 'ROOKIE' album bundle from , which will include ONE entry pass and ONE autograph pass (limited to 200 pax only). In conjunction with this event, there will be a dance cover competition where participants are required to send in their dance cover of any Red Velvet's song via (https://lnk.to/CoverDanceMY) from 28 March 2017 to 9 April 2017. Both solo and group acts with 2 to 5 dancers are welcomed to join. On 10th of April 2017, all the videos submitted will be uploaded on the Universal Music Malaysia Regional Facebook page for voting. The voting will end on 16 April 2017, by 11.59pm. The video with the highest number of likes will advance to perform in front of Red Velvet. The group will be given professional comments from Red Velvet as well as a chance to take a group photo with them.